All purpose (AP) blocks are a great all around solution. Self-lubricating Acetal polymer sheaves running on polished stainless steel races perform equally well with dynamic loads and high static loads. 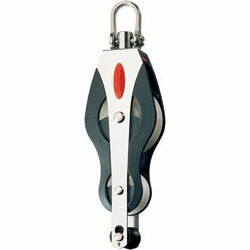 For durability and a long service life, these blocks are the right choice for sheets, halyards and control line applications for cruising and racing.Captive Lock™ universal head can be fixed in either of two planes, or free to swivel as required. Becket pin is removable so line can be spliced prior to fitting and is ingeniously locked into position without the use of a clevis pin, split ring or tools.